At a family gathering this weekend a relative asked me what areas of environmental action are ripe for progress. He wanted to know where he should direct his retirement energies. In other words, how could he actually do some good? He and his wife live in New Hampshire, and as the opportunity presents itself there every four years, they become engaged in presidential politics. But with his candidate sitting in the White House, there’s less to do this time around. There seems to be less opportunity to do anything through government these days. The Tea Party may be new, but this reality isn’t for U.S. conservation groups. The euphoria generated by passage of the Clean Water Act, the Clean Air Act, and the Endangered Species Act in the 1970’s has been dampened by decades of rising neoliberalism. An academic term used mostly by social scientists, neoliberalism doesn’t refer to so-called “big government,” but rather its opposite; the idea that the solutions to society’s problems can be found in the free market. It’s now become conservative mantra: Government isn’t the solution, business is the solution. Whether you believe this is one of the unshakable laws of the universe or not, in a democracy perception is reality. 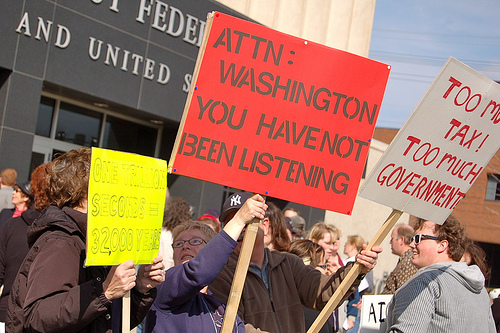 If enough people believe it, government support weakens and public initiatives fade. Seeing the writing on the wall, many environmental groups eventually stopped banging their head against it (at least some of the time). Instead, starting in the 1990’s, many have linked up with interested businesses to identify more sustainable supplies of raw materials and help these businesses produce products in a more eco-friendly way. One common approach for doing this is through certification schemes, in which independent non-profit groups verify that ecolabeled products are produced in an environmentally responsible (ideally sustainable) manner. The Forest Stewardship Council (FSC), which certifies wood harvested from responsibly managed forests, is probably the best known scheme in the U.S. Today, FSC certified products can be found in many major home improvement stores. But retailers didn’t embrace environmental awareness easily. Only after groups such as the Rainforest Action Network, Greenpeace and the Natural Resources Defense Council among others, unleashed banners, bus tours, and bear costumes over two years of activism did Home Depot and its competitors agree to favor FSC certified wood. Since then, certification schemes have emerged for dozens of products, including seafood (the Marine Stewardship Council and Aquaculture Stewardship Council), appliances (Energy Star), and buildings (LEED). More businesses are embracing this approach, including Walmart, once considered the evil embodiment of laissez-faire retail practices. Walmart is now a serious player in the sustainability game, working with dozens of conservation groups and others to achieve measurable sustainability goals over the next few years. But back to my relative’s question: does any of this make a difference? I’ve been engaged in various efforts to answer that question over the years as a consultant, and my short answer is, it’s hard to say. Evidence is spotty and right now we can only have faith in the logic: If more businesses are improving their environmental practices, it stands to reason there must be some benefit. As consumers, one easy thing we can do is vote with our wallets and purchase certified products over other brands. Yet to a certain extent, certification implies that we can have our cake and eat it too – something that flies in the face of logic. Can we really have low prices (always!) and live sustainably at the same time? What if we simply end up consuming more and gobbling up all the gains? Neoliberalism notwithstanding, simple solutions rarely solve complicated problems. Maybe in a few years if the political pendulum starts swinging back the other way, my New Hampshire relatives will have some additional options for making a difference, and I can give a better answer. Next Next post: A Panasonic Pandora’s box?